I tend to write posts for problems I come across and can’t find an answer out there…anywhere! This year I wanted to make gingerbread cookies for my kid’s teachers. I knew exactly what I wanted to accomplish (a yummy gingerbread cookie dipped in white chocolate and sprinkled with crushed candy canes.) It sounded simple enough. However, if you saw my post last year about perfect stained glass cookies you would know I don’t make gift cookies from scratch. I always use a mix, for the very practical reason of having no qualms about tossing a batch if it doesn’t come out well. For me, I would rather make something that I have no personal investment in until it’s ready to be baked, and then I can spend time being decorative. I did it! They turned out so good I have made 6 bags of cookies over the last four weeks. We took a couple dozen to our local fire station and police station, but we ate the rest! These are so incredibly good! Everyone who has one immediately wants another. These are so good you are going to feel like cookie monster! And that is exactly the kind of cookie I want to gift! I want the people I give cookies to, to really enjoy them. These are super simple (although you can take more time and get more decorative on the larger ones.) I will show you how I made all of them. Trust me when I say: make more than you need! These are super addictive and you are going to want enough to have for yourself! And a few more…and maybe one more…and then just one more…Oh, my! These are good! I wanted round cookies. 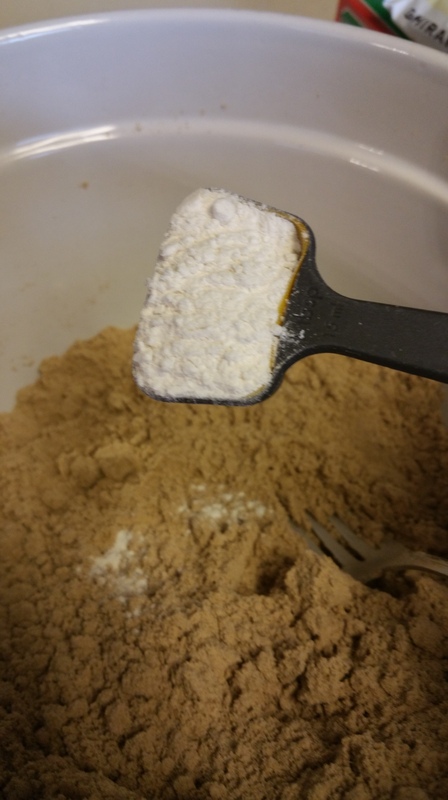 I didn’t need to mix it for cutouts, but I added an extra tablespoon of flour to the mix because I knew I was going to be handling these and they needed to be a little stiffer than a drop cookie would be. 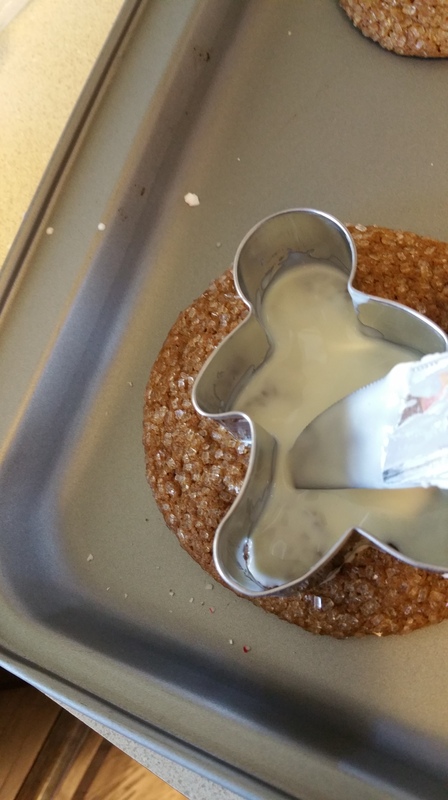 Next you are going to want to make sure this becomes a gingerbread cookie. For this I added the following ratio of spices and I wouldn’t change a thing. 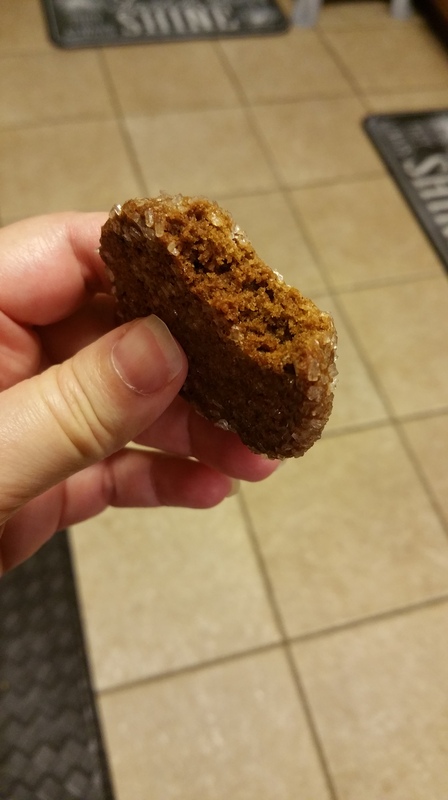 They are nice and spicy with this amount of ginger and there’s no mistaking this is a gingerbread cookie. 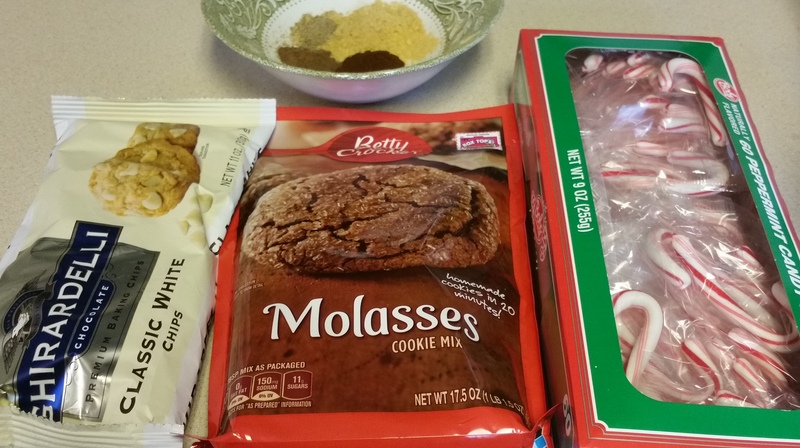 (Also, there is already cinnamon in the cookie mix so I didn’t add any more). Don’t freak out about the cracked pepper. We all thought the idea of salted caramel was weird a few years ago! 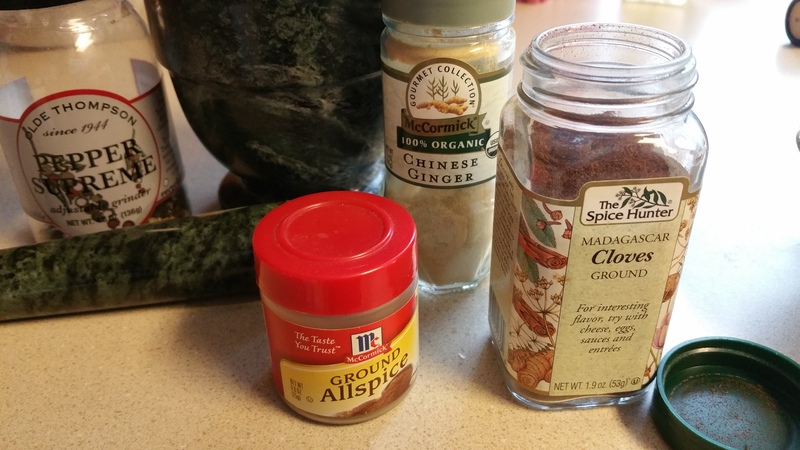 Heat your oven to 350 degrees F. In a medium bowl add the cookie mix, spices and the flour. Stir with a fork until all added ingredients are incorporated into the mix. Add the softened butter, water and egg. Stir with a spoon or spatula until a soft dough forms. 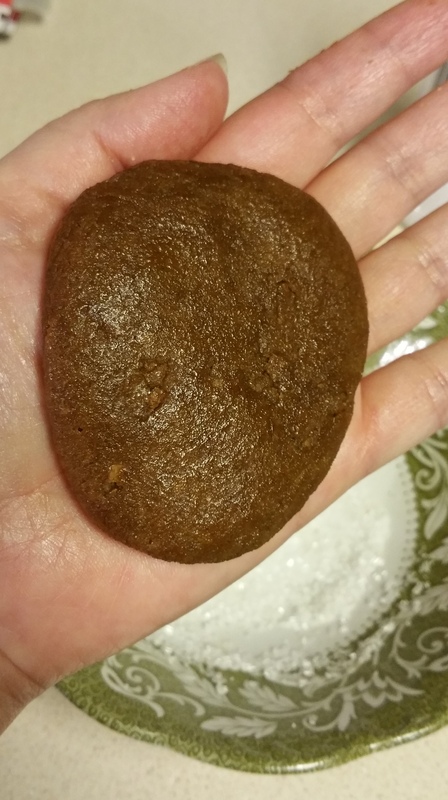 For ginger snap sized cookies (these are tiny) use a rounded tsp of dough. For regular sized cookies use a rounded Tbs of dough. For the big cookies to gift people roll a large fist sized ball in your hands. Place the big gift sized cookies about 6 to a sheet. I make extra big cookies and give one per person or make a box and have one extra large cookie and a couple small decorated ones. If you go to your local baker or coffee shop you will notice they don’t sell small cookies. Take a cue from the professionals and go big! It’s way less work to make a few large pretty cookies than thirty small ones as gifts AND the recipient will remember them. Next is the white chocolate! For the extra large gift cookies I placed a festive cookie cutter on top of the cookie and painted inside it. I did not use icing although you could. I used a cup of white chocolate chips and a Tbs of coconut oil. (You could use shortening instead. It needs to be a fat that is solid at room temperature.) Heat the chocolate mixture in the microwave at 20 second intervals and stir between each heating. You want runny, warm but not hot, chocolate. This will make a chocolate sauce that is good for dipping, drizzling or “painting” (which is what I did on the extra large cookies.) Make sure your cookies are completely cool before starting to ice or put chocolate on them. This is also why you added the extra flour. 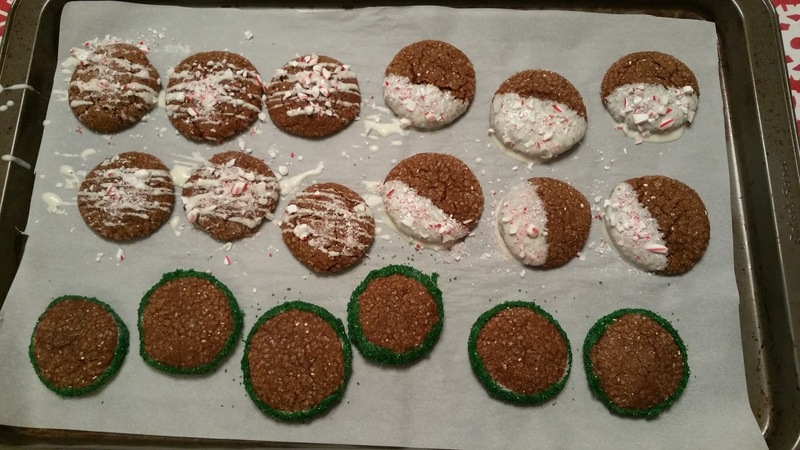 The extra flour will stiffen the cookies and hold the cookies together as you handle them. As you are putting the chocolate on you need to have your crushed candy canes ready. 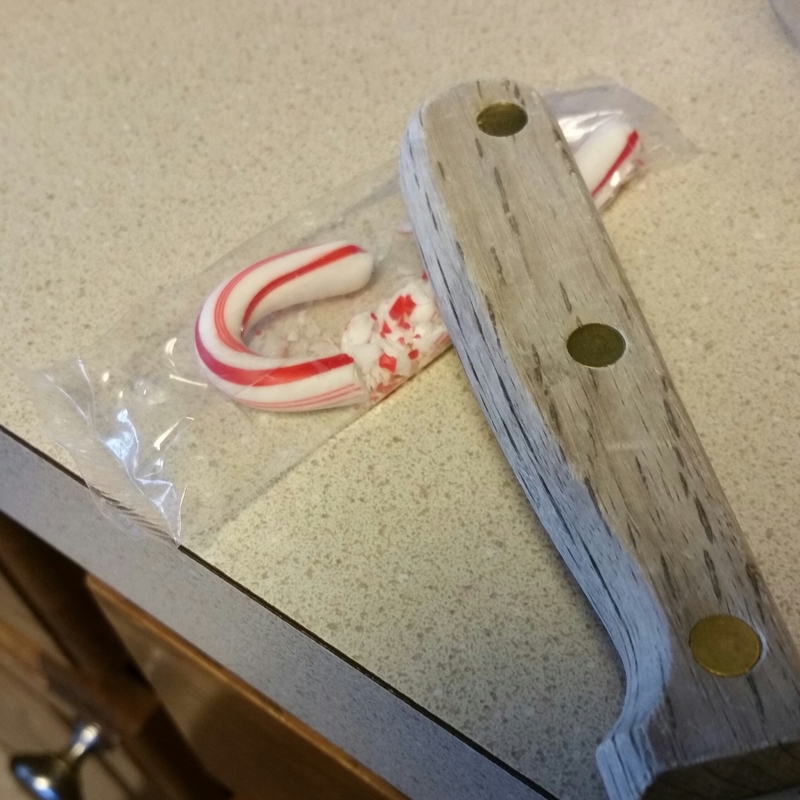 I had a box of mini candy canes and I crushed them with the wooden handle of a knife right in the little bags they came in. This made for easy application, too. 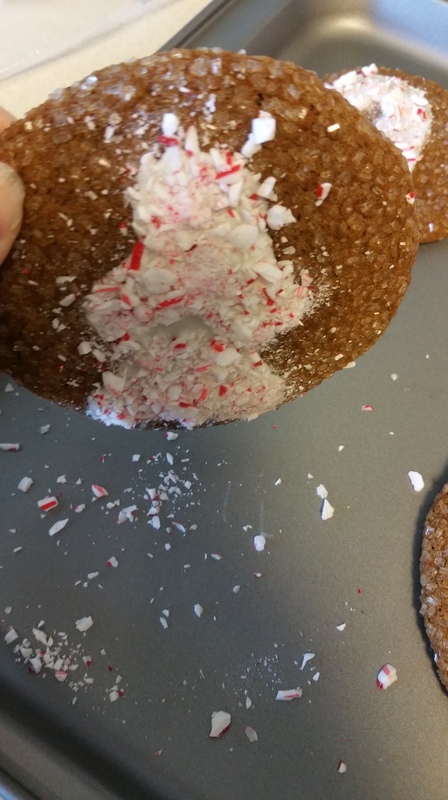 I just cut the end off with scissors and sprinkled the candy cane pieces directly on the cookie. Do one cookie at a time or your chocolate will harden and the candy won’t stick. You don’t have to push the candy down. They will stick on their own. 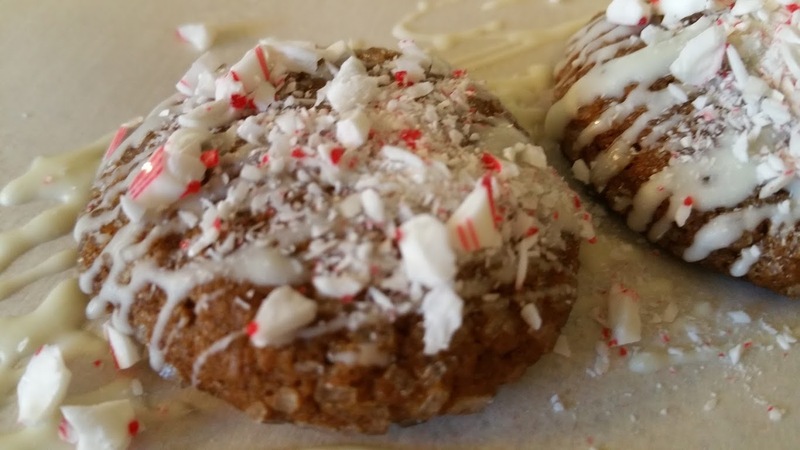 The crushed candy canes will have good chunks and not so pretty powder at the bottom. 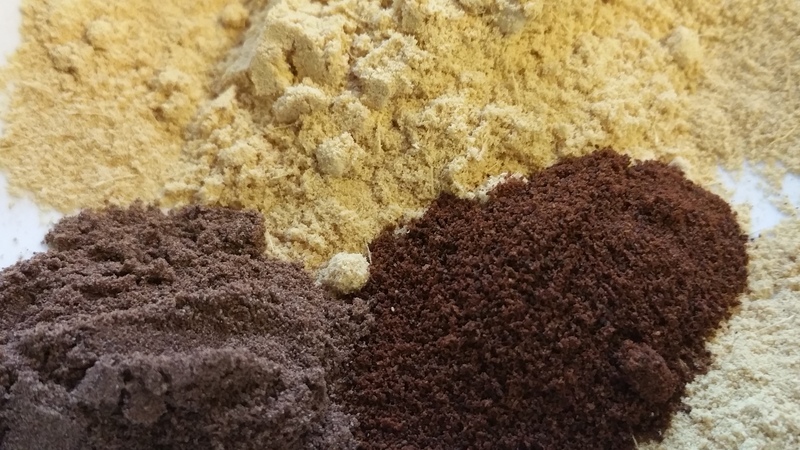 If you really want to go all out you could put the candy in a sieve and separate the powder from the chunks. But be careful. 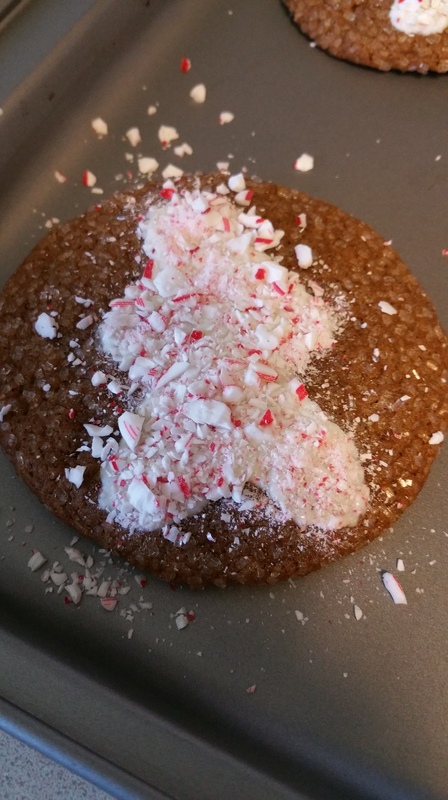 The high humidity we have down here made the candy pieces stick to everything (including themselves) and weren’t usable after about fifteen minutes because they had fused back together and stuck to the cookie sheet. I would crush and apply as you go. 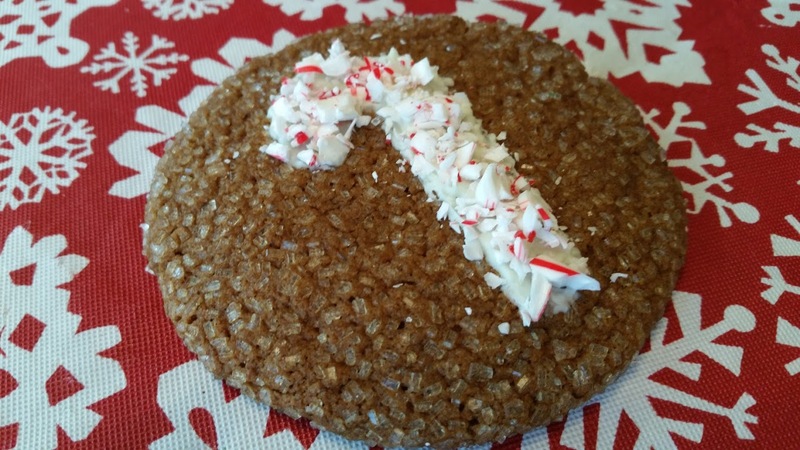 For drizzling: Use a tablespoon sized spoon, get enough to cover the spoon but not pool, scrape off the bottom of the spoon and start drizzling off to the side of the cookie and then go back and forth across it. The reason being: The beginning of your drizzle will be a big blob and dropping that on a cookie defeats the purpose of a pretty drizzle pattern. For dipping: Use a small bowl. This is the easiest application of the chocolate. Just dip half the cookie, it looks nice that way. For “Painting”: Use a butter knife. 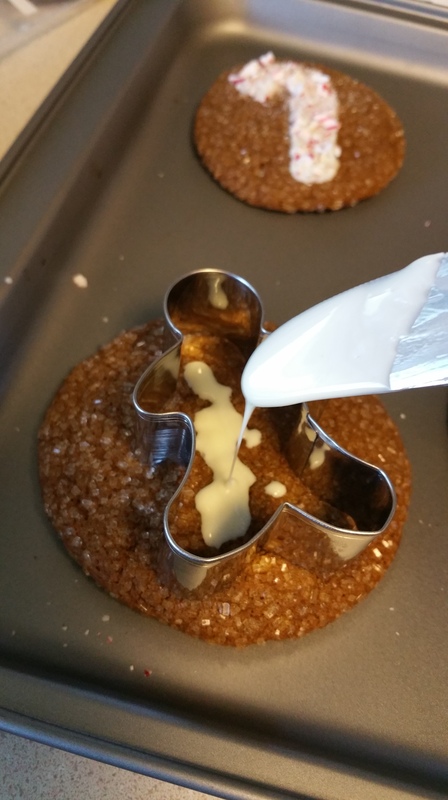 Place a cookie cutter on top of the cookie (If you followed the above directions the cutter will not go into the cookie so make sure you hold it in place. I dipped a butter knife, drizzled down the center of the cookie cutter and then used the knife to dip in the chocolate and paint the chocolate up against the inside of the cutter. All of the cookie cutter painted chocolate cookies turned out pretty, but I liked the candy cane shape best. 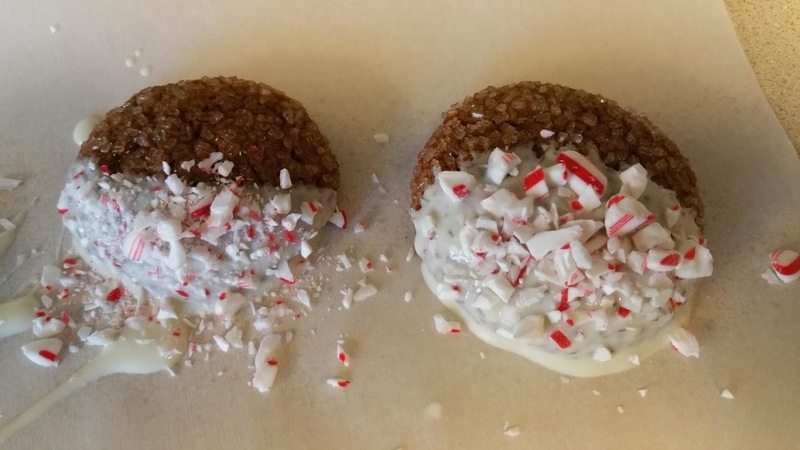 As you are adding chocolate to the cookies, sprinkle the crushed candy cane as you go. Once the chocolate hardens back up you can’t get the candy to stick. Go slow and reheat the chocolate in 20 second intervals in the microwave to keep it flowing. 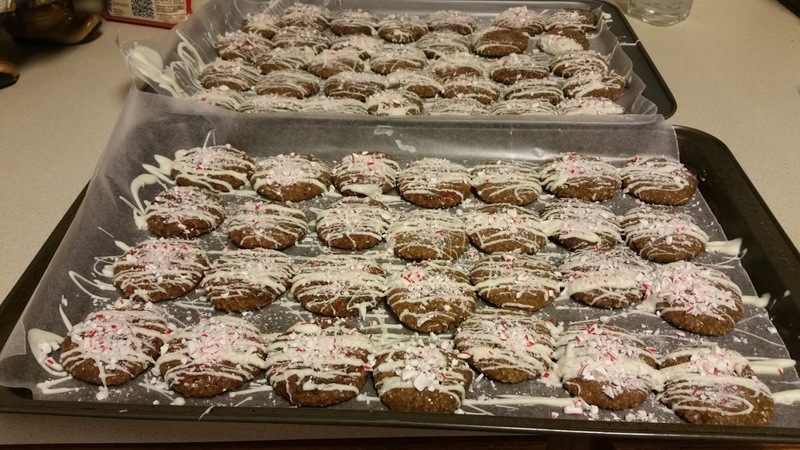 I used parchment paper underneath the cookies and clean up was a breeze. I alternated the techniques and came up with some beautiful cookies. Great in cellophane bags, glassine envelopes or a little paper box! If you aren’t too particular even a Ziplock bag will do! 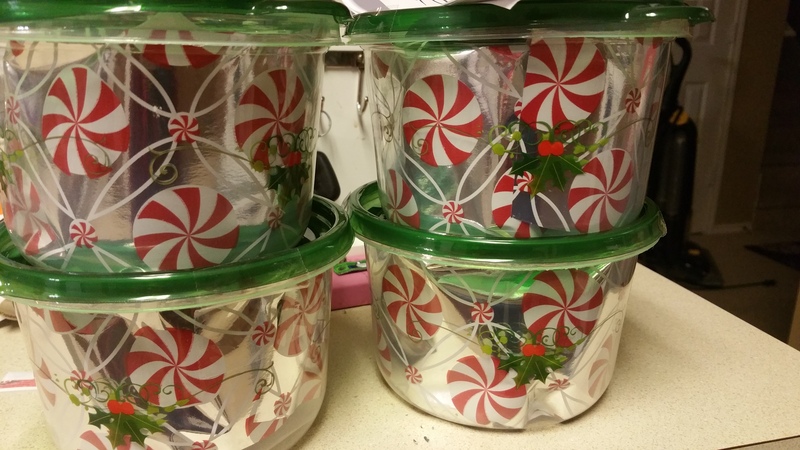 We found some holiday themed food containers for the teachers and bus driver. I stacked them on platters for the firemen and policemen. I dropped some pretty wrapping paper down the sides of these containers. They were a hit! 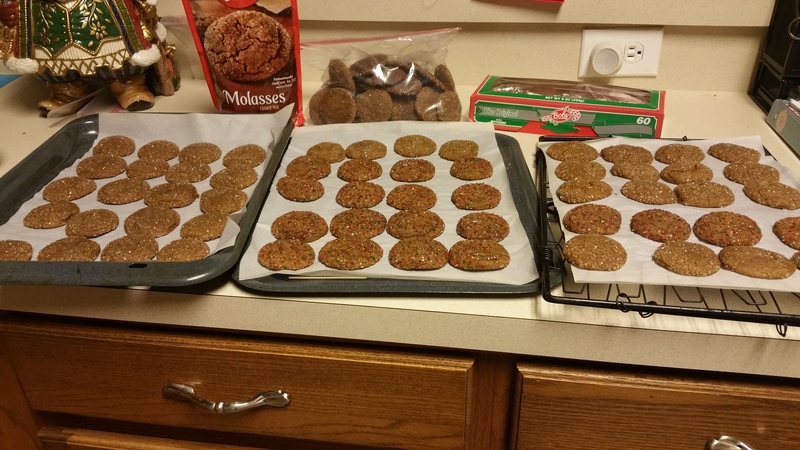 Because of the humidity and the way sugar will absorb water from the air: I individually bagged the big cookies and grouped the smaller cookies by decorative type and bagged and froze everything. I got them out in the morning last Friday to send as gifts for the last day of school before Christmas break. For the stacked cookies make sure you stack them at the very last minute. 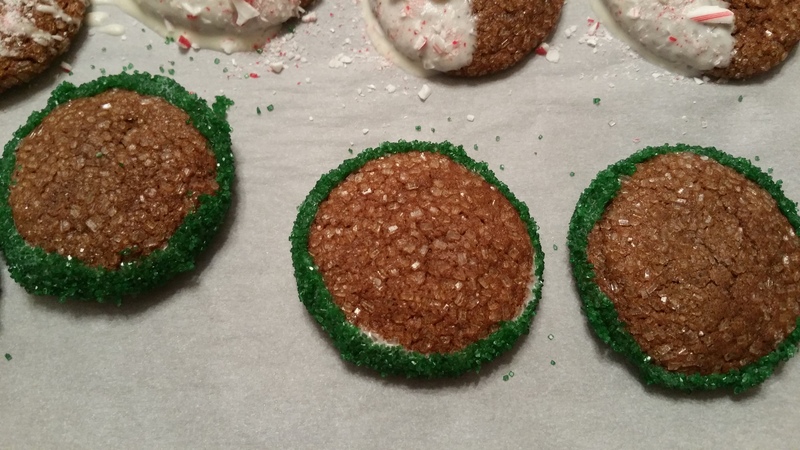 The chocolate and candy on them will fuse the cookies together, if you do it early. These are all gone! I actually have more mix to make for tomorrow. 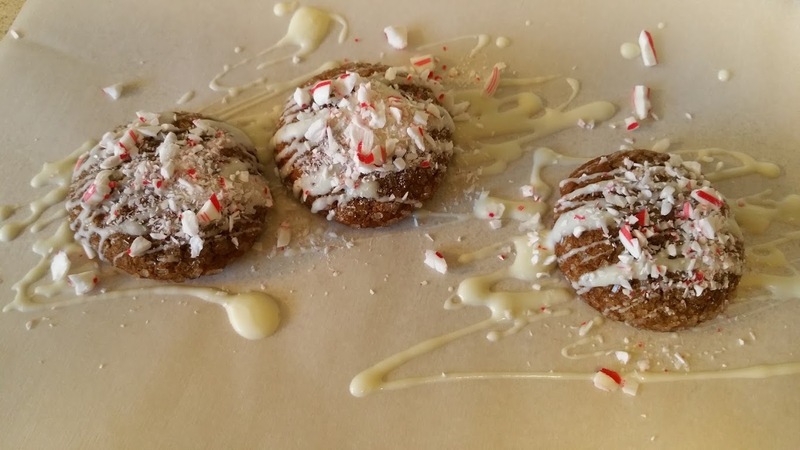 You really don’t need to decorate them, but the candy canes and chocolate put these incredible cookies over the top! These fast fun and incredibly tasty cookies are going to make you crave them every year! I’m making another batch for Santa tomorrow! Plan to make them when the grandboys visit tomorrow.. They can do the prep. Thanks for a great treat! ‘Tis NOT the season for a diet! I hope you enjoy these. They’re worth the calories! They were yum! Grandboys enjoyed making them especially the pounding and crushing by 3 yr old lol..headed to gym now. Happy New Year! Have enjoyed reading your posts over the years. I’m so glad you liked them! Thanks for following my posts. It gives me motivation! My six year old really enjoyed smashing our candy, too! Thanks for coming by and commenting! I appreciate it! 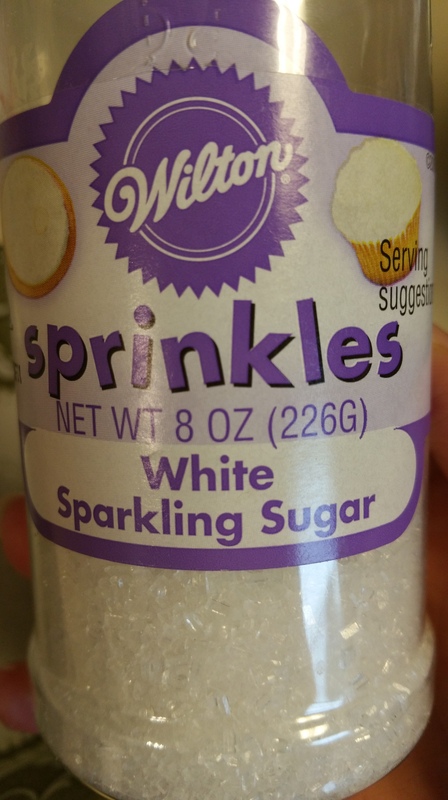 What an enchanting sugar-delivery system! Hehe! Yes. That’s definitely one way to look at it!